To say I’ve been dying to share this editorial wedding photoshoot is the understatement of the year! Last spring, the talented ladies of Et Voila Events and Frontier Flowers of Fontana and I dreamed up a moody, intimate, romantic elopement wedding set to take place in Stevens Point, Wisconsin, showcasing some fantastic details along with the incredible scenery where I call home. I absolutely love Stevens Point, and wanted to share its gorgeousness and tall pines through my lens. 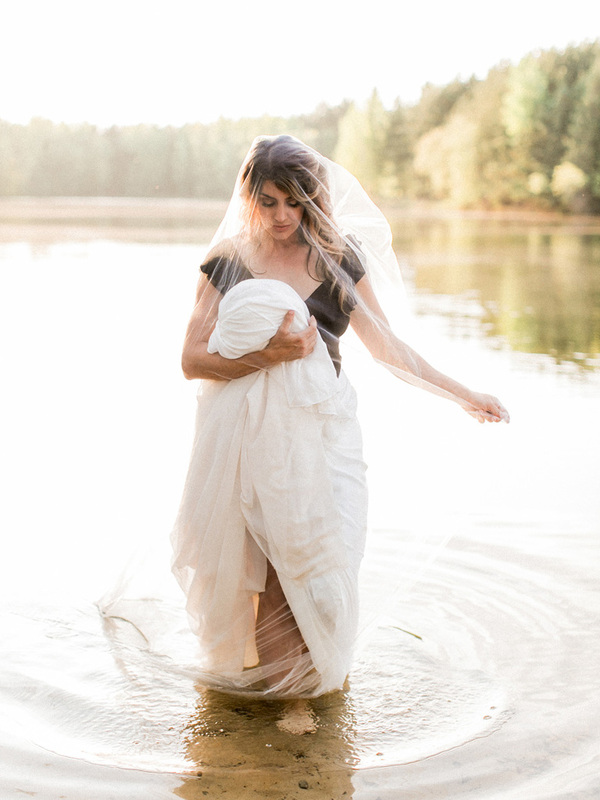 We drew inspiration directly from the woods and lakes of beautiful central Wisconsin, and the intimacy of eloping. There’s something magical and uniquely private about marrying your best friend in the middle of the woods! We envisioned a palette from very organic, raw elements of the earth—greens found in the natural settings, moody blacks, and soft blues and grays. Our initial dream for the elopement included these elements combined with overflowing greenery and florals, including local pine and foraged materials from the woods. We lit up thinking of telling a love story in these verdant surroundings. The bride began her day on the farm with her horse, meeting her groom before eloping in the woods. The couple whispered meaningful vows under a round canopy of greens and florals including lily of the valley, peonies, larch, garden roses, columbine, hellebores, lilac, fern + foraged pine. Their intimate dinner with a handful of friends followed in a stone cottage in the woods. The cottage stands apart with its hand-hewn beams and charming fireplace, with another overflowing floral installation from Frontier Flowers of Fontana above the cozy fireplace. Seniman Calligraphy crafted raw, organic invitations with watercolor and lettering in blacks, blues, and grays with gold foil accents. Black taper candles filled the farm table from A La Crate Rentals, using simple organic-shaped dinnerware accented with gold flatware. Silk + Willow adornments line the plates and the bride’s bouquet, as well as delicate greens on the table, with rustic wood chairs and simple gold vessels.